I have a 66 valiant 100 wagon. The rear end has been whining for quite awhile. Last few days it has been creaking and popping when I stop and start. The noise seems to be coming from the drivers side and it really whines on left curves. I kinda think it's the bearings, but not sure. Anyway, it's time to get my baby fixed. Tearing apart the rear axle is beyond my mechanical abilities. I could handle changing out the entire rear axle. Money is a little tight at the moment and I'm trying to avoid the shop expense. My question is what cars would have the same rear axle assembly that I could just switch out? If you can change out a rear then you have the skills to swap an axle out. That said its probably cheaper to swap the whole rear out yourself than to pay someone to fix the bad axle you have. This should show you how I did mine, and I do believe if you want to change the rear end out anything up to 73 A body will fit, but remember, you will need U-Bolts if it is a 8 1/4 rear end, yoke,, but finding another 7 1/4 it is possible that it will need this dun as well, I elected to check my problem out and repair it. I am not a good tec, But! I am sure one will jump in here and guide you soon..Here is pictures and read what problems I ran into page 19 in my restoration thread here http://www.forabodiesonly.com/mopar/showthread.php?t=41794&page=19 and there is a 66 Valint/dart manual you can down loud here . The small bolt pattern 7.25 rears are dirt cheap by comparison. The hard part is finding one that isn't just as well worn as the one you have. Without doing the research I'm going to say the bearing, etc.. to refurbish the unit are easier to find than the brake drums on it. The following is from my experience... A parts yard is going to torch cut U bolts, park brake cables, everything, to remove the axle so the labor in R&R to your car will be quite a task. On the other hand, you could drop the unit you have at the spring hangers, properly remove those other attachments, and refurbish it. The 35 bucks for new U bolts could be better spent. I did read you comment about your ability but I'm not buying it. If you can read and follow instructions you can do anything. If you should find that just replacing one outer bearing will buy some time, that's fine too. It's been done a million times before. You want to take a drive to Vegas I'll give you the one from my 64 Dart. How can I tell if I have a 7.25 rear end or the 8.25???? If it has a cover it is not a 8.25. Oops, I was thinking 8.75. Not true!! 8 1/4" have a cover! If it is the original small bolt pattern it is a 7 1/4", if it has the larger 4.5" bolt pattern it is either a 7 1/4" from 73 and up or an 8 1/4" from 73 and up! Either way it would have to have been swapped in there at some time! There are several ways to tell whether its a 7.25 rear or something else. Measure the axle tube diameter. I pulled the brakes and pulled the axle (no need to open the rear end cover on these 7 1/4"s .... removed axle bearing and replaced it along with a new seal. I did this myself under a tree just had to have the bearing pressed on and then reassembled, I did end up removing the rear end cover and clean but it seamed all my shavings stayed in the outer axle ..
Wrong... diff cover and "c" clips need removal, to take out axles..
(1) vehicle to a desirable working height and install jack stands. (2) Remove wheel cover and wheel and tire assembly. Remove brake drum. Clean all dirt and foreign material from area of housing cover. (3) Loosen housing cover and drain lubricant from rear axle and proceed to remove cover. (4) Turn differential case to make differential pinion shaft lock screw accessible and remove lock screw and pinion shaft (Fig. 3). 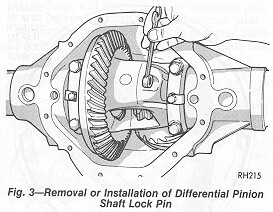 (5) Push axle shaft toward center of vehicle and remove the &#8220;C&#8221; locks from recessed groove of axle shaft (Fig. 4). (6) Remove axle shaft from housing being careful not to damage the axle shaft bearing which will remain in the rear axle housing. (7) Inspect the axle shaft bearing surfaces for signs of brinnelling, spalling or pitting. If any of these conditions are present both the shaft and the bearing should be replaced. The normal bearing contact on the shaft will be a dull gray and may appear lightly dented. (8) Remove axle shaft seal from housing bore. 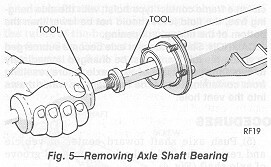 (9) To remove the axle shaft bearing from axle housing (Fig. 5), use Tool C-4167. Attach Tool C-637 to end of selected remover, using a slide hammer motion, remove axle shaft bearing and inspect and discard if axle shaft or bearing shows any of the conditions. If axle shaft and bearing show no signs of distress, they can be reinstalled along with a new axle shaft seal. Never reuse an axle shaft seal under any circumstances once it has been removed. OK, thanks again everyone!!! I can tell by the backing plate, it is a 7.25 rear end. Now I just have to find a good running replacement. Remember If you can't find one in your area, I will gladly give you the one I got. 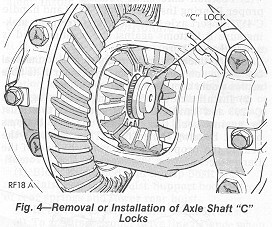 (5) Push axle shaft toward center of vehicle and remove the C locks from recessed groove of axle shaft (Fig. 4). Those instructions Might be right for 8.25's. but for 66 original axles that are 7.25 you don't have any clips. just use a auto store "rental" axle puller after you remove the drums,brake shoes and the 4 bolts holding the axle flange to the axle. (it's easier to have the bearings pressed on and off. but you can do it yourself if you need to. good chisel and a little sweat to go with it can remove the locking spacer. ) I just pay to get mine pressed on for the amount of work involved. I just replaced the rear axle bearings in my 7.25 and the axles have NO provision for C clips. I think they made a mistake in those pictures because here's the FSM page showing the 7.25.
when i changed my bearings years ago i took the drum off. took everything else in there off (brakes, backing plate bolts...) and put the drum on backwards and threw a couple lug nuts on there. leave space for the drum to slide on the studs and yank on the drum. mine came out pretty easy. or you could rent the puller. Why not get a factory service manual and learn how to do it yourself? It is very simple. C clips? No...the bearings are press fit and thats the only thing that keeps the axles in a 7.25. Remove bearing retainer and the axles will slide out with a hard tug. 1 inch wide bearing holding axle in or 1/16" c clip? Ill go with bearing. Again, THANKS to everyone for your information and help. Got a line on a ring, pinion and carrier and will buy new bearings all around. I've got a 7 1/4 out of a 66 dart if you are interested. Make you a deal you can't resist!